Thai and Vietnamese food has taken the world by storm, with its hot, sweet, sour, salty flavours. The Wickedfood team has spent collectively over two years in South East Asia, visiting the major cooking schools throughout the country, as well as spending numerous hours with street food vendors, learning the secrets of this intriguing cuisine. 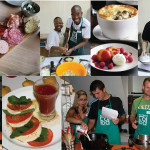 In this hands-on workshop, we will teach you how to make a variety of easy dishes, for a casual dinner party. Included in the price is tea and coffee on arrival, extensive notes, the hands-on cooking workshop and lunch at the end of the workshop. Chaing Mai noodle curry chicken – one of the great curry noodle dishes of northern Thailand.